As a pastoralist society, the Maasai way of life revolves around their livestock. They often times will travel hundreds of miles of semi-arid and arid terrain of Kenya and Tanzania in search of grazing lands and watering holes for their cattle. The cows are invaluable in providing a constant source of protein in the form of meat, blood, and milk, but also supplying the dried dung for constructing their semi-temporary huts. Considering the importance of cattle in their society, a Maasai male’s amount of wealth as well as his allotment of wives are usually determined by the number of cattle he possesses. The Maasai people are a society reminiscent of a way of life long before the Industrial Revolution and the current post-industrial period where technology has become a global norm. However, the Maasai pastoralist traditions have managed to endure in the midst of extreme social change. How have they been able to do this? Today, you will still see the Maasai people migrating across many miles of dry desert in their traditional garb composed of a checkered cape and an assortment of bracelets for the women and men. However, there is one new added accessory. A cell phone. The Maasai today can now use the GPS on their cell phones to locate grazing areas and watering holes for their cattle and also take advantage of other mobile applications such as those that locate potential predators in the area. Cell phones have made avoiding as well as hunting lions much easier for the Maasai people. Many members of their society have even taken advantage of cell phones to establish and boost a tourism business geared towards offering outsiders a taste of the Maasai life. Hence, cell phones have paradoxically been a key component in maintaining the Maasai's traditional way of life in the face of extreme social change during the Age of Globalization. The Maasai people are an illustrative example of how one particular society has been able to straddle two stages of societal development (i.e., pastoralist and post-industrial) simultaneously. This chapter on “society” first explicates the different stages of societal development, and later introduces the classical views of Weber, Marx, and Durkheim concerning the impact of social change from the pre-industrial societies such as the Maasai people to the industrialized societies that appear to be much more commonplace today. Maasai men showing their jumping dance. The simplest definition of society is a group of people who share a defined territory and a culture. In sociology, we take that definition a little further by arguing that society is also the social structure and interactions of that group of people. Social structure is the relatively enduring patterns of behavior and relationships within a society. Thus, a society is not only the group of people and their culture, but the relationships between the people and the institutions within that group. In sociology, a distinction is made between society and culture. Culture refers to the norms, values, beliefs, behaviors, and meanings given to symbols in a society. Culture is distinct from society in that it adds meanings to relationships. For instance, what it means to be a "husband" to a gay couple in Boston is very different from what it means to be a husband to a polygamist man in rural southern Utah. Thus, while the relationship exists in both (i.e., they both have social structure), what the relationship means differs by culture. All human societies have a culture and culture can only exist where there is a society. Sociologists distinguish between society and culture despite their close interconnectedness primarily for analytical purposes: It allows sociologists to think about societal development independent of culture and cultural change (which are discussed in the next chapter in greater detail) even though societal change and development are contingent upon culture. This chapter presents a brief overview of some of the types of human societies that have existed and continue to exist. It will then present some classic approaches to understanding society and what changing social structure can mean for individuals. The sociological understanding of societal development relies heavily upon the work of Gerhard Lenski. Lenski outlined some of the more commonly seen organizational structures in human societies. Classifications of human societies can be based on two factors: (1) the primary means of subsistence and (2) the political structure. This chapter focuses on the subsistence systems of societies rather than their political structures. While it is a bit far-reaching to argue that all societies will develop through the stages outlined below, it does appear that most societies follow such a route. Human groups begin as hunter-gatherers, move toward pastoralism and/or horticulturalism, develop toward an agrarian society, and ultimately end up undergoing a period of industrialization (with the potential for developing a service industry following industrialization). Not all societies pass through every stage. 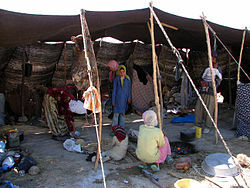 Some societies have stopped at the pastoral or horticultural stage (e.g., Bedouin nomads), though these may be temporary pauses due to economic niches that will likely disappear over time. Some societies may also jump stages as a result of the introduction of technology from other societies. It is also worth noting that these categories aren't really distinct groups as there is often overlap in the subsistence systems used in a society. Some pastoralist societies also engage in some measure of horticultural food production and most industrial and post-industrial societies still have agriculture, just in a reduced capacity. The hunter-gatherer way of life is based on the exploitation of wild plants and animals. Consequently, hunter-gatherers are relatively mobile, and groups of hunter-gatherers have fluid boundaries and composition. Typically in hunter-gatherer societies men hunt larger wild animals and women gather fruits, nuts, roots, and other edible plant-based food and hunt smaller animals. Hunter-gatherers use materials available in the wild to construct shelters or rely on naturally occurring shelters like overhangs. Their shelters give them protection from predators and the elements. The majority of hunter-gatherer societies are nomadic. It is difficult to be settled under such a subsistence system as the resources of one region can quickly become exhausted. Hunter-gatherer societies also tend to have very low population densities as a result of their subsistence system. Agricultural subsistence systems can support population densities 60 to 100 times greater than land left uncultivated, resulting in denser populations. Hunter-gatherer societies also tend to have non-hierarchical social structures, though this is not always the case. Because hunter-gatherers tend to be nomadic, they generally do not have the possibility to store surplus food. As a result, full-time leaders, bureaucrats, or artisans are rarely supported by hunter-gatherer societies. The hierarchical egalitarianism in hunter-gatherer societies tends to extend to gender-based egalitarianism as well. Although disputed, many anthropologists believe gender egalitarianism in hunter-gatherer societies stems from the lack of control over food production, lack of food surplus (which can be used for control), and an equal gender contribution to kin and cultural survival. The line between agricultural and hunter-gatherer societies is not clear cut. Many hunter-gatherers consciously manipulate the landscape through cutting or burning useless (to them) plants to encourage the growth and success of those they consume. Most agricultural people also tend to do some hunting and gathering. Some agricultural groups farm during the temperate months and hunt during the winter. A pastoralist society is a society in which the primary means of subsistence is domesticated livestock. It is often the case that, like hunter-gatherers, pastoralists are nomadic, moving seasonally in search of fresh pastures and water for their animals. Employment of a pastoralist subsistence system often results in greater population densities and the development of both social hierarchies and divisions in labor as it is more likely there will be a surplus of food. Horticulturalist societies are societies in which the primary means of subsistence is the cultivation of crops using hand tools. Like pastoral societies, the cultivation of crops increases population densities and, as a result of food surpluses, allows for a division of labor in society. Horticulture differs from agriculture in that agriculture employs animals, machinery, or some other non-human means to facilitate the cultivation of crops while horticulture relies solely on humans for crop cultivation. A tractor ploughing an alfalfa field circa 1921. A pineapple farmer in Ghana. Agrarian societies are societies in which the primary means of subsistence is the cultivation of crops using a mixture of human and non-human means (i.e., animals and/or machinery). Agriculture is the process of producing food, feed, fiber, and other desired products by the cultivation of plants and the raising of domesticated animals (livestock). Agriculture can refer to subsistence agriculture or industrial agriculture. Subsistence agriculture is agriculture carried out for the production of enough food to meet just the needs of the agriculturalist and his/her family. Subsistence agriculture is a simple, often organic, system using saved seed native to the ecoregion combined with crop rotation or other relatively simple techniques to maximize yield. Historically most farmers were engaged in subsistence agriculture and this is still the case in many developing nations. In developed nations a person using such simple techniques on small patches of land would generally be referred to as a gardener; activity of this type would be seen more as a hobby than a profession. Some people in developed nations are driven into such primitive methods by poverty. It is also worth noting that large scale organic farming is on the rise as a result of a renewed interest in non-genetically modified and pesticide free foods. In developed nations, a farmer or industrial agriculturalist is usually defined as someone with an ownership interest in crops or livestock, and who provides labor or management in their production. Farmers obtain their financial income from the cultivation of land to yield crops or the commercial raising of animals (animal husbandry), or both. Those who provide only labor but not management and do not have ownership are often called farmhands, or, if they supervise a leased strip of land growing only one crop, as sharecroppers. Agriculture allows a much greater density of population than can be supported by hunting and gathering and allows for the accumulation of excess product to keep for winter use or to sell for profit. The ability of farmers to feed large numbers of people whose activities have nothing to do with material production was the crucial factor in the rise of surplus, specialization, advanced technology, hierarchical social structures, inequality, and standing armies. 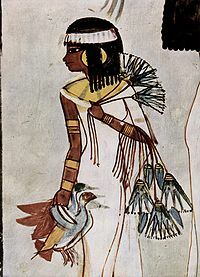 Horticulture and agriculture as types of subsistence developed among humans somewhere between 10,000 and 8,000 B.C.E. in the Fertile Crescent region of the Middle East. The reasons for the development of horticulture and agriculture are debated but may have included climate change and the accumulation of food surplus for competitive gift-giving. Most certainly there was a gradual transition from hunter-gatherer to agricultural economies after a lengthy period when some crops were deliberately planted and other foods were gathered from the wild. In addition to the emergence of farming in the Fertile Crescent, agriculture appeared by at least 6,800 B.C.E. in East Asia (rice) and, later, in Central and South America (maize and squash). Small scale agriculture also likely arose independently in early Neolithic contexts in India (rice) and Southeast Asia (taro). Full dependency on domestic crops and animals (i.e. when wild resources contributed a nutritionally insignificant component to the diet) did not occur until the Bronze Age. If the operative definition of agriculture includes large scale intensive cultivation of land, i.e., mono-cropping, organised irrigation, and use of a specialized labor force, the title "inventors of agriculture" would fall to the Sumerians, starting around 5,500 B.C.E. By the early 1800s agricultural practices, particularly careful selection of hardy strains and cultivars, had so improved that yield per land unit was many times that seen in the Middle Ages and before, especially in the largely virgin lands of North and South America. In the world, the use of crop breeding, better management of soil nutrients, and improved weed control have greatly increased yields per unit area. At the same time, the use of mechanization has decreased labor input. The developing world generally produces lower yields, having less of the latest science, capital, and technology base. More people in the world are involved in agriculture as their primary economic activity than in any other, yet it only accounts for four percent of the world's GDP. 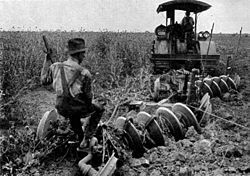 The rapid rise of mechanization in the 20th century, especially in the form of the tractor, reduced the necessity of humans performing the demanding tasks of sowing, harvesting, and threshing. With mechanization, these tasks could be performed with a speed and on a scale barely imaginable before. These advances have resulted in a substantial increase in the yield of agricultural techniques that have also translated into a decline in the percentage of populations in developed countries that are required to work in agriculture to feed the rest of the population. As the pie chart below indicates, about 1% of Americans are employed in agriculture today and produce sufficient food to feed the other 99% of Americans. 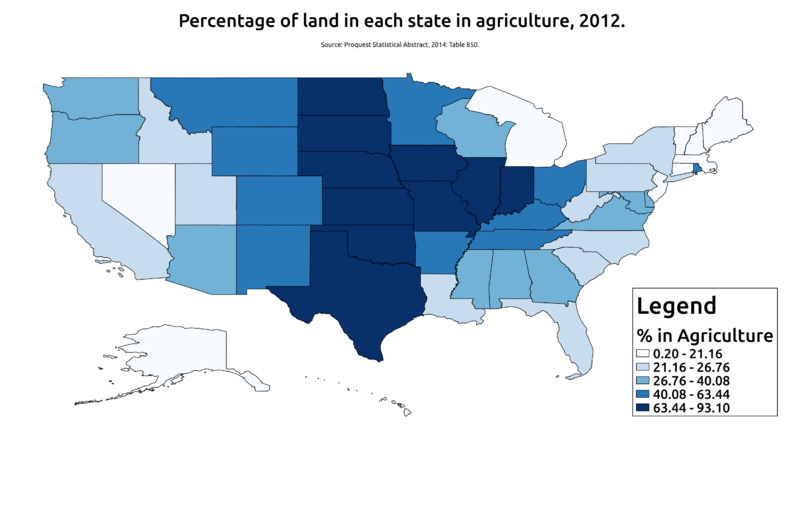 Percent of the U.S. population employed in agriculture by Census District. Source: US Census 2000. 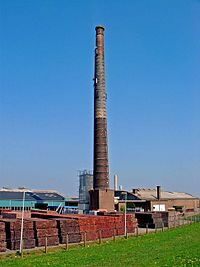 A brick factory in the Netherlands is an example of industry. An industrial society is a society in which the primary means of subsistence is industry. Industry is a system of production focused on mechanized manufacturing of goods. Like agrarian societies, industrial societies increase food surpluses, resulting in more developed hierarchies and significantly more division of labor. The division of labor in industrial societies is often one of the most notable elements of the society and can even function to re-organize the development of relationships. Whereas relationships in pre-industrial societies were more likely to develop through contact at one's place of worship or through proximity of housing, industrial society brings people with similar occupations together, often leading to the formation of friendships through one's work. When capitalised, The Industrial Revolution refers to the first known industrial revolution, which took place in Europe during the 18th and 19th centuries. What is some times referred to as The Second Industrial Revolution describes later, somewhat less dramatic changes resulting from the widespread availability of electric power and the internal-combustion engine. Many developing nations began industrialisation under the influence of either the United States or the USSR during the Cold War. 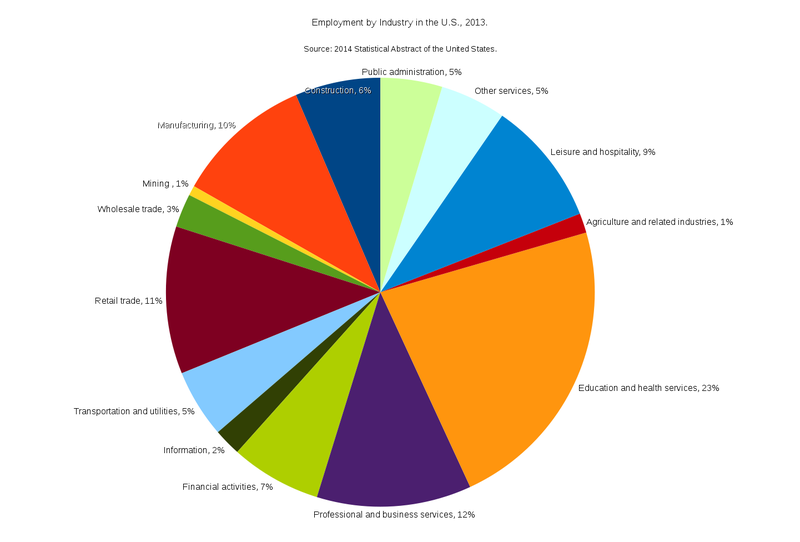 Today, industry makes up only a relatively small percentage of highly developed countries' workforce (see the pie chart above), in large part due to advanced mechanization. The use of machines and robots to facilitate manufacturing reduces the number of people required to work in industry by increasing their efficiency. As a result, a single worker can produce substantially more goods in the same amount of time today than they used to be able to produce. This has also resulted in a transition in most highly developed countries into a post-industrial or service-oriented economy. A post-industrial society is a society in which the primary means of subsistence is derived from service-oriented work, as opposed to agriculture or industry. It is important to note here that the term post-industrial is still debated in part because it is the current state of society; it is difficult to name a phenomenon while it is occurring. Most highly developed countries are now post-industrial in that the majority of their workforce works in service-oriented industries, like finance, healthcare, education, business or sales, rather than in industry or agriculture. This is the case in the U.S., as depicted in the pie chart above. Post-industrial society is occasionally used critically by individuals seeking to restore or return to industrial development. Increasingly, however, individuals and communities are viewing abandoned factories as sites for new housing and shopping. Capitalists are also realizing the recreational and commercial development opportunities such locations offer. The stages of societal development. As noted throughout the above discussion of societal development, changes in the social structure of a society - in this case the primary means of subsistence - also affect other aspects of society. For instance, as hunters and gatherers make the transition into pastoralism and horticulture, they also develop a surplus in food stuffs. While it is common for people in the developed world today to have lots of surplus food, we rarely consider just how important that extra food is. To begin with, once a society has surplus food, that means more of their children will survive into adulthood. Additionally, as food yields increase in agricultural societies, smaller percentages of the population are required to produce the food for the rest of the population. This frees up those people not engaged in food production to specialize in other areas, like clothing or housing production. This results in specialists: some people become experts in growing crops or raising livestock while others become experts in clothing production, metal-working, home construction, etc. That specialization leads to rapid increases in technology as people are freed from having to spend the majority of their time finding or growing their food and can then spend their time improving at their speciality. The relationship between surplus and technology may not seem obvious, initially, but surplus is clearly the forerunner of technological development. This is illustrated in the diagram to the right. The diagram shows societal development along the top and the implications of societal development along the bottom. The arrows running between the two rows illustrate the fact that these relationships are very complex. For instance, specialization not only results from agriculture but also from denser populations and surplus and helps spur industry. The point being, these are interdependent aspects of societal development that co-evolve. One additional outcome of surplus that is included in the diagram is inequality. Inequality will be discussed in much greater detail later in this book, but it is important to note that as soon as there is surplus, there will be greater surplus for some people, and some people - as evidenced in most developed societies today - may not have access to enough resources despite the exist of a surplus within the larger society. Those with more surplus have an economic advantage relative to those with less surplus as they have greater bargaining power and in many cases - et voilà, social inequality is born. As Western societies transitioned from pre-industrial economies based primarily on agriculture to industrialized societies in the 19th century, some people worried about the impacts such changes would have on society and individuals. Three early sociologists, Weber, Marx, and Durkheim, perceived different impacts of the Industrial Revolution on the individual and society and described those impacts in their work. Max Weber was particularly concerned about the rationalization and bureaucratization of society stemming from the Industrial Revolution and how these two changes would affect humanity's agency and happiness. As Weber understood society, particularly during the industrial revolution of the late 19th century in which he lived, society was being driven by the passage of rational ideas into culture which, in turn, transformed society into an increasingly bureaucratic entity. Bureaucracy is a type of organizational or institutional management that is, as Weber understood it, rooted in legal-rational authority. Bureaucracy is a complex means of managing life in social institutions that includes rules and regulations, patterns and procedures that both are designed to simplify the functioning of complex organizations. An example of bureaucracy would be the forms used to pay one's income taxes - they require specific information and procedures to fill them out. Included in that form, however, are countless rules and laws that dictate what can and can't be tied into one's taxes. Thus, bureaucracy simplifies the process of paying one's taxes by putting the process into a formulaic structure, but simultaneously complicates it by adding rules and regulations that govern the procedure. Weber did believe bureaucracy was the most rational form of institutional governance, but because Weber viewed rationalization as the driving force of society, he believed bureaucracy would increase until it ruled society. Society, for Weber, would become almost synonymous with bureaucracy. As Weber did not see any alternative to bureaucracy, he believed it would ultimately lead to an iron cage: there would be no way to get out of it. Weber viewed this as a bleak outcome that would affect individuals' happiness as they would be forced to function in a highly rational society with rigid rules and norms without the possibility to change it. Because Weber could not envision other forces influencing the ultimate direction of society - the exception being temporary lapses into non-bureaucracy spurred by charismatic leaders - he saw no cure for the iron cage of rationality. Society would become a large bureaucracy that would govern people's lives. Weber was unable to envision a solution to his iron cage of bureaucracy dilemma. Since a completely rational society was inevitable and bureaucracy was the most rational form of societal management, the iron cage, according to Weber, does not have a solution. Karl Marx took a different perspective on the impact of the Industrial Revolution on society and the individual. In order to understand Marx's perspective, however, it is necessary to understand how Marx perceived happiness. According to Marx, species being (or happiness) is the pinnacle of human nature. Species being is understood to be a type of self-realization or self-actualization brought about by meaningful work. But in addition to engaging in meaningful work, self-actualized individuals must also own the products of their labors and have the option of doing what they will with those products. In a capitalist society (which was co-evolved with the Industrial Revolution), rather than owning the fruits of their labors, the proletariat or working class owns only their labor power, not the fruits of their labors (i.e., the results of production). The capitalists or bourgeoisie employ the proletariat for a living wage, but then keep the products of the labor. As a result, the proletariat is alienated from the fruits of its labor – they do not own the products they produce, only their labor power. Because Marx believed species being to be the goal and ideal of human nature and that species being could only be realized when individuals owned the results of their labors, Marx saw capitalism as leading toward increasingly unhappy individuals; they would be alienated from the results of their production and therefore would not be self-realized. But the alienation from the results of their production is just one component of the alienation Marx proposed. In addition to the alienation from the results of production, the proletariat is also alienated from each other under capitalism. Capitalists alienate the proletariat from each other by forcing them to compete for limited job opportunities. Job opportunities are limited under capitalism in order for capitalists to keep wages down; without a pool of extraneous workers, capitalists would have to meet the wage demands of their workers. Because they are forced to compete with other members of the proletariat, workers are alienated from each other, compounding the unhappiness of the proletariat. While Marx did have a solution to the problem of alienation, he seldom discussed it in detail. Marx's proposed solution was for the proletariat to unite and through protests or revolution (or legislation in democratic nations) overthrow the bourgeoisie and institute a new form of government – communism. This form of government would be based on communally owned and highly developed means of production and self-governance. The means of production would be developed – through capitalism – to the point that everyone in society would have sufficient 'free' time to allow them to participate in whatever governmental decisions needed to be made for the community as a whole. By re-connecting the individual with the fruits of their labor and empowering them toward true self-governance, species being would be realized and happiness would be returned. Two additional comments are in order here. First, the economic systems that developed in The Soviet Union and China - as well as other parts of the world - was not the communism envisioned by Marx. Rather, they had achieved a form of socialism, what Marx called the stage between capitalism and communism. Second, Marx believed capitalism, while harmful to species being, was necessary to advance the means of production to a stage where communism (as he envisioned it) could be realized. Thus, while Marx was highly critical of capitalism, he also recognized its utility in developing the means of production. Durkheim's view of society and the changes it was undergoing as a result of industrialization also led him to believe unhappiness was a possible outcome. Durkheim believed that an important component of social life was social solidarity, which is understood as a sense of community. In his classic study, Suicide, Durkheim argued that one of the root causes of suicide was a decrease in social solidarity – termed anomie (French for chaos) by Durkheim. Durkheim also argued that the increasing emphasis on individualism found in Protestant religions – in contrast to Catholicism – contributed to an increase in anomie, which resulted in higher suicide rates among Protestants. In another work, The Division of Labor in Society, Durkheim proposed that pre-industrial societies maintained their social solidarity through a mechanistic sense of community and through their religious affiliations. Most people were generalists in their work – they farmed and created their own tools and clothing. Because they were alike in their generality, they were also more likely to share a sense of community, which Durkheim saw as an important component of happiness. In addition to their similarity in occupations, many individuals belonged to the same religious groups, which also fostered a sense of solidarity. In industrializing societies, Durkheim recognized the inevitability of specialization. By definition, specialization means that individuals are going to have dissimilar occupations. This specialization would also affect religion. In industrial societies, religion would become just one aspect of lives that were increasingly divided into compartments – home, family, work, recreation, religion, etc. Durkheim believed there were two components that would alleviate the decreasing social solidarity in industrializing societies: organic solidarity and conscientious attempts to find camaraderie through one's place of employment. Whereas social solidarity was maintained in pre-industrial societies through a mechanistic sense of similarity and dependence along with communal religious affiliations, in industrialized societies, social solidarity would be maintained by the interdependence of specialists on one another. If one individual specialized in treating the injured or ill, they would not have time to raise crops or otherwise produce food. Doctors would become dependent on farmers for their food while farmers would become dependent on doctors for their healthcare. This would force a type of organic solidarity — organic in the sense that the parts were interdependent like the organs of an animal are interdependent for their survival. In addition to the inevitable interdependence a specialized society would warrant, Durkheim believed that a conscientious effort to develop and foster friendships would transition from a religious brotherhood to friendships developed at one's place of employment. Specialized individuals would have a great deal in common with their co-workers and, like members of the same religious congregations in pre-industrial societies, co-workers would be able to develop strong bonds of social solidarity through their occupations. Thus, for Durkheim, the answer to the decrease in mechanistic solidarity and the increasing anomie was organic solidarity and solidarity pursued within one's speciality occupation. Sociologists have observed increases in surpluses of goods, densities of populations, the division of labor, technological advances, as well as inequality as societies have transitioned from one stage of societal development to the next. Weber, Marx, and Durkheim, focusing specifically on the transition from pre-industrial societies to the industrialized societies that they were witnessing during their lifetime, argued that there was also increased rationalization and bureaucratization, greater alienation from the fruits of labor and from each other, and the shift from mechanic solidarity to organic solidarity, respectively. However, what sociologists in the past did not anticipate was the dramatic effects of globalization on societal development. In the face of rapid globalization today, there are some societies that are currently straddling multiple stages of societal development like the Maasai people discussed at the beginning of the chapter, while others may have skipped over stages entirely. As societies continue to alter, modify, and transform with changing times, they offer new objects of study for sociologists in which prevailing theories can be improved. Collins, Randall. 2004. Interaction Ritual Chains. Giddens, Anthony. 1984. The Constitution of Society: Outline of the Theory of Structuration. Weber, Max. 1920. Economy and Society: An Outline of Interpretive Sociology. Berger, Peter and Thomas Luckmann. 1967. The Social Construction of Reality. New York: Doubleday. How is a society different from a nation or country? Why might societies develop in the pattern that they do? What is the relationship between surplus and inequality? Does development necessarily imply progress? How can our existing understanding of societal development and social change be improved to account for anomalies, such as certain societies avoiding change and others skipping expected stages of development? How does globalization fit into existing views of societal development and social change? ↑ Swidler, A. (2003). Talk of Love: How Culture Matters. University Of Chicago Press. ↑ a b c Diamond, Jared. 2005. Guns, Germs, and Steel: The Fates of Human Societies. 1st ed. W.W. Norton & Co.
↑ a b Durkheim, Emile, and Lewis A. Coser. 1997. The Division of Labor in Society. Free Press. ↑ Bell, D. (1973). The Coming of Post-Industrial Society : a Venture in Social Forecasting. Basic Books. ↑ Weber, Max. 1997. The Theory Of Social And Economic Organization. Free Press. ↑ Marx, Karl. 1906. Capital: A Critique of Political Economy. Modern Library Giant. The Modern Library. ↑ Durkheim, Emile. 1997. Suicide. Free Press. Haferkamp, Hans, and Smelser, Neil J. Editors. 1992. Social Change and Modernity. Berkeley: University of California Press. Winds of Change: Reforms and Unions - The impacts of industrialization in Canada; illustrated with many late 19th century photographs. This page was last edited on 26 September 2018, at 21:23.